The War of the Rebellion: A Compilation of the Official Records of the Union and Confederate Armies, Series I, Vol. XXXIV, Part I. Page 883 Chapter XLVI. SKIRMISH NEAR FREMONT'S ORCHARD, COLO.
APRIL 12, 1864. 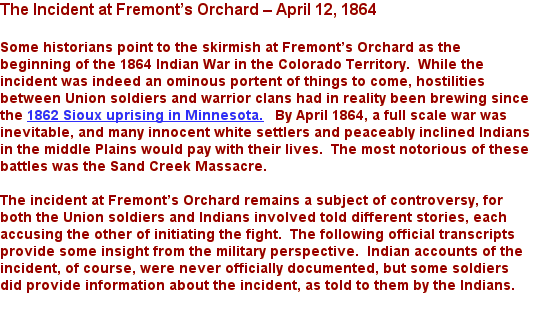 - Skirmish near Fremont's Orchard, Colo. Numbers 1. - Captain George L. Sanborn, First Colorado Cavalry. Numbers 2. - Lieutenant Clark Dunn, First Colorado Cavalry. Numbers 1. Reports of Captain George L. Sanborn, First Colorado Cavalry. CAMP SANBORN, April 12, 1864. Indians, and at the time of the skirmish had with him but 15 men. This much I have learned from the messenger verbally. expressman with further news as soon as we get it. 8,000 more cartridges for the carbines for this command. Major Downing was here when the information was received and fully concurs in the action taken. Captain, First Colorado Cavalry, Commanding. P. S. - Lieutenant Dunn says they represented themselves (the Indians) to be Cheyennes; they also had carbine pistols. Page 884 LOUISIANA AND THE TRANS-MISSISSIPPI. Chapter XLVI. CAMP SANBORN, April 13, 1864.
arrow-head still remaining in. John Crosby, pistol wound, breaking the right arm between shoulder and elbow; the ball still in the arm. strong picket out up and down the Platte to protect the route and ranchmen. Numbers 2. Report of Lieutenant Clark Dunn, First Colorado Cavalry. CAMP SANBORN, Colo. Ten., April 18, 1864.
being the first aggressor, I dismounted, walked forward to meet their chief, and tried to obtain the stock without any resort to violence. Page 885 Chapter XLVI. EXPEDITION UP MATAGORDA BAY, TEX. the advice of my guide I turned toward, about sunset, and reached camp before daylight the next morning. band would never again have troubled the settlers in this vicinity. about 12 or 15 more. Second Lieutenant, First Colorado Cavalry, Commanding Detach. Page 887 Chapter XLVI. EXPEDITION TO BEAVER CREEK, - KANS. APRIL 14 - 18, 1864. - Expedition from Camp Sanborn, Colo., to Beaver Creek, Kans. Report of Lieutenant Clark Dunn, First Colorado Cavalry. CAMP SANBORN, COLO. TER., April 18, 1864.
though compelled to remain constantly in the saddle for sixty hours, marching about 250 miles, with regret relinquished the pursuit. Too much credit cannot be awarded them. Page 888 LOUISIANA AND THE TRANS-MISSISSIPPI. Chapter XLVI. The War of the Rebellion: A Compilation of the Official Records of the Union and Confederate Armies, Series I, Vol. XXXIV, Part III. Page 151 Chapter XLVI. CORRESPONDENCE, ETC.-UNION. HEADQUARTERS DISTRICT OF COLORADO, Denver, Colo. Ter. April 13, 1864. Indians who had a fight with a detachment of Companies C and H, under Lieutenant Dunn, on 12th instant, near Fremont's Orchared. They had stolen stock, and refused to give it up. In the fight referred to several Indians were killed, and 4 men of Company C wounded. Laramie. Dunn and Chase are after them. We send you more carbine cartridges by to-morrow's coach. Page 166 LOUISIANA AND THE TRANS-MISSISSIPPI. HEADQUARTERS DISTRICT OF COLORADO, Denver, Colo., April 15, 1864.
to look for the Indians in another direction. returned to Camp Sanborn, now about 10 or 12 miles distant. Page 167 Chapter XLVI. CORRESPONDENCE, ETC.-UNION. Colonel First Cavalry of Colorado, Commanding District. HEADQUARTERS, Camp Sanborn, April 15, 1864.
but may save them. Your communication of the 13th was received at 11 o'clock on the 14th. Cartridges came all right this morning. Captain First Cavalry of Colo., Commanding Camp Sanborn. Inclosed I send you copy of a note received from Mr. Gerry yesterday. GERRY'S RANCH, April 14, 1864. Page 168 LOUISIANA AND THE TRANS-MISSISSIPPI. Chapter XLVI. month of Beaver Creek, and thirty lodges at Valley Station, all Sioux. The above is the report of the Indians that are camped here. Page 188 LOUISIANA AND THE TRANS-MISSISSIPPI. Chapter XLVI. BOONEVILLE, COLO. TER., April 16, 1864. Page 189 Chapter XLVI. CORRESPONDENCE, ETC.-UNION. take from us the only protection to our women and children we have taking away Company L.
Should this be the case I am sure that you will have a remonstrance sent you as long as the moral law, headed by. HEADQUARTERS, Camp Sanborn, Colo. Ter., April 16, 1864.
doing very well, and will soon be around again unless their wounds prove to be worse than they appear. Captain, First Cavalry of Colorado, Commanding Camp Sanborn. HEADQUARTERS DISTRICT OF COLORADO, Denver, Colo. Ter., April 16, 1864.
will daily communicate with these headquarters. If more troops are needed report that fact, and all others promptly. Page 190 LOUISIANA AND THE TRANS-MISSISSIPPI. Chapter XLVI. refusing to give it up. Carbines with ammunition are en route to Camp Fillmore. been escorting said train, to return with his command to Camp Fillmore, Colo. Ter. Page 242 LOUISIANA AND THE TRANS-MISSISSIPPI. Chapter XLVI. INDIAN RANCH, April 20, 1864.
them. Will follow the trail as long as my horses will stand it. needed to wipe them out, as the marches are necessarily so long that the horses will not endure it. More horses are also required. their marches will be short, that when they meet the Indians their horses will be fresh and vigorous. If anything occurs will write you. sides, or the emigration will be interrupted. The people along the Platte are generally very much terrified. lower down the Platte, and commanded by some active man. There is no pen or ink here, consequently I have to use a pencil. Camp Sanborn, April 20, 1864. Page 243 Chapter XLVI. CORRESPONDENCE, ETC. - UNION. Acting Hospital Steward Mead, who wishes to keep it, by your permission. and Kelley's and were despoiling property, getting drunk, and raising the mischief generally. become nearly worked down, so we shall have to have transportation for rations furnished in Denver. Camp Sanborn, April 20, 1864 - 5 p. m.
SIR: Major Downing has returned, having traveled about 140 miles. write more fully to-morrow and send by coach. Captain, First Cavalry Colorado, Commanding Camp Sanborn. Page 250 LOUISIANA AND THE TRANS-MISSISSIPPI. Chapter XLVI. Camp Weld, April 21, 1864.
he will arrive in Denver to-morrow afternoon. He is returning for lighter transportation. The teams he has with him have given out. CAMP SANBORN, April 21, 1864. Page 251 Chapter XLVI. CORRESPONDENCE, ETC.-UNION. thought we could reach them by daylight the next morning; that the Indians would not expect us, knowing that we had traveled all day. fresh. Marched then toward Poll Creek and Cedar Bluffs. Found no Indian signs. reporting all that he does to me. have been made at night, and when it is possible I intend they all shall be, as I think by that means we will be more likely to find them. proper officers to forward immediately and oblige me. Page 252 LOUISIANA AND THE TRANS-MISSISSIPPI. Chapter XLVI. trouble and corroborate the statement made by Mr. Ripley, which I understand has been contradicted. Major First Cavalry of Colorado. DENVER, COLO, TER., April 21, 1864. I think Cheyennes. About 60 turned up Beavere Creek. Gone to Republican. We are after them. Page 407 Chapter XLVI. CORRESPONDENCE, ETC. - UNION. First Cavalry of Colorado, Commanding District. COLONEL: Since my last we have been busily engaged scouting, &c., endeavoring to ascertain the whereabouts of the enemy. impulse, I would kill him. Should he attempt to escape will settle him. probably keep everything safe until my return. If anything occurs, and I am able, will send you the news. Major, First Cavalry of Colorado. Page 907 Chapter XLVI. SKIRMISH AT CEDAR BLUFFS, COLO.
MAY 3, 1864.-Skirmish at Cedar Bluffs, Colo.
Reports of Major Jacob Dowing, First Colorado Cavalry. Had a fight with the Cheyennes to-day. Killed about 25 Indians, wounded about 35 or 40 more. Lost 1 man killed and 1 wounded. particulars. Send me 5,000 cartridges immediately. Howitzers are needed. MURRAY AND KELLEY'S RANCH, May 3, 1864. Page 908 Chapter XLVI. LOUISIANA AND THE TRANS-MISSISSIPPI. troops, will it again any way. First Colorado Cavalry, Commanding District. P. S.-Cedar Bluffs is about 60 miles distant. We started yesterday about 2 o'clock and returned this evening. Page 916 Chapter XLVI. LOUISIANA AND THE TRANS-MISSISSIPPI. MAY 9-10, 1864.-Scout from American Ranch to Cedar Bluffs, Colo.
Report of Major Jacob Dowing, First Colorado Cavalry. AMERICAN RANCH, May 11, 1864.
canon, feeling that in that manner only could I drive them from the river and remove the danger. Therefore, on the 9th instant, at 2 p. m.
the soldiers, and that they (the Sioux) had refused to join them, when the Cheyennes in their fright determined to seek safety in flight. far is favorable to a speedy adjustment of this difficulty, provided the pursuit is, for a short time hence, vigorously maintained. telegraph me at the Junction. be made with all the southern Sioux without any more fighting. Camp Sanborn, on the north side of the South Platte river, about the twelfth of April, 1864. I was at Camp Sanborn, inspecting troops. understood, to disarm the Indians if he found them in possession of the stock, but to use every means to avoid a collision with them. collision with them; and continue up to the present time . . .
“Sand Creek Massacre” – United States Congress, Senate. Report of the Secretary of War, Sand Creek Massacre, Sen. Exec. the river started in the direction of the stock at the same time, when I halted my command, and wheeled into line towards the Indians. follow their trail. I afterwards made repeated scouts after them for that and other depredations, but did not find them. Commission adjourned until 2 p. m. this day. Two p. m.--Commission met pursuant to adjournment. Present, all members and recorder. Examination of Second Lieutenant Joseph A. Cramer, veteran battalion first Colorado cavalry continued. the whites, were attacked by a large party of soldiers and some of them killed and their ponies driven off.